Hubble gets a closer look Wolf-Rayet galaxy SBS 1415+437, a star-bursting galaxy with an unusually high number of extremely hot and massive stars known as Wolf-Rayet stars. This NASA/European Space Agency (ESA) Hubble Space Telescope picture shows a galaxy named SBS 1415+437 (also called SDSS CGB 12067.1), located about 45 million light-years from Earth. These stars can be around 20 times as massive as the sun, but seem to be on a mission to shed surplus mass as quickly as possible — they blast substantial winds of particles out into space, causing them to dwindle at a rapid rate. A typical star of this type can lose a mass equal to that of our sun in just 100,000 years! These massive stars are also incredibly hot, with surface temperatures some 10 to 40 times that of the sun, and very luminous, glowing at tens of thousands to several million times the brightness of the sun. Many of the brightest and most massive stars in the Milky Way are Wolf-Rayet stars. Because these stars are so intense they do not last very long, burning up their fuel and blasting their bulk out into the cosmos on very short timescale — only a few hundred thousand years. Because of this it is unusual to find more than a few of these stars per galaxy — except in Wolf-Rayet galaxies, like the one in this image. 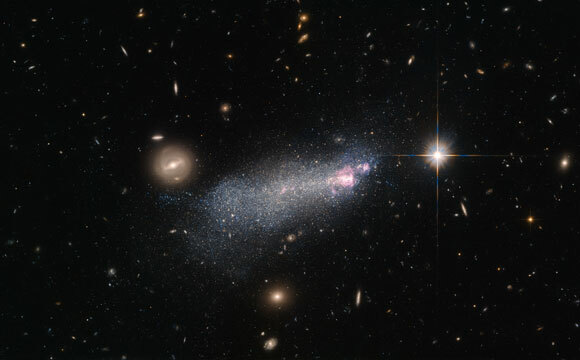 Be the first to comment on "Hubble Image of Wolf-Rayet Galaxy SBS 1415+437"